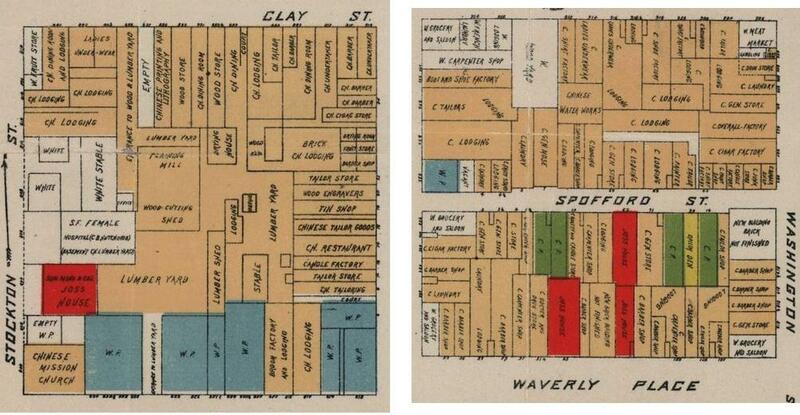 San Francisco Chinatown: 1885 map shows gambling, prostitution, overcrowding. This map was published in 1885 as part of an official survey of living conditions in San Francisco’s Chinatown. You can see a zoomable version of the document here. The map, produced as part of a report written by a committee appointed by the Board of Supervisors, is an incredibly detailed one, recording the function and use of every dwelling in 12 blocks of Chinatown. In order to note uses of dwellings and businesses, appointed surveyors performed a detailed door-to-door canvas of the area. The resulting map catalogs illegal activities (prostitution, gambling, and opium dens) along with cultural landmarks (“joss houses,” or temples). It also notes areas in which Chinese immigrants lived, as well as spots in Chinatown where “white” residents were to be found. In the mid-19th century, many Chinese immigrants entered the United States through San Francisco. Facing housing discrimination and poverty, they gravitated toward cheap housing in proximity to one another. After the passage of the Chinese Exclusion Act in 1882, white vigilantism against Chinese immigrants drove many rural laborers into the city, and Chinatown’s population expanded. Historian Nayan Shah writes that San Francisco officials investigated conditions in Chinatown at least five times during the second half of the 19th century. Maps and detailed descriptions of living conditions were often included in these reports. Shah argues that this data was used to bolster an image of Chinatown as dirty, lawless, and alien, and to provide support for enforcement of new public health ordnances. I first saw this map on the Appendix Journal’s Facebook page. Its editors found the item in the David Rumsey Historical Map Collection, using the Digital Public Library of America’s search tools. “Official Map of Chinatown in San Francisco.” 1885. David Rumsey Map Collection. Details of “Official Map of Chinatown in San Francisco.” David Rumsey Map Collection.